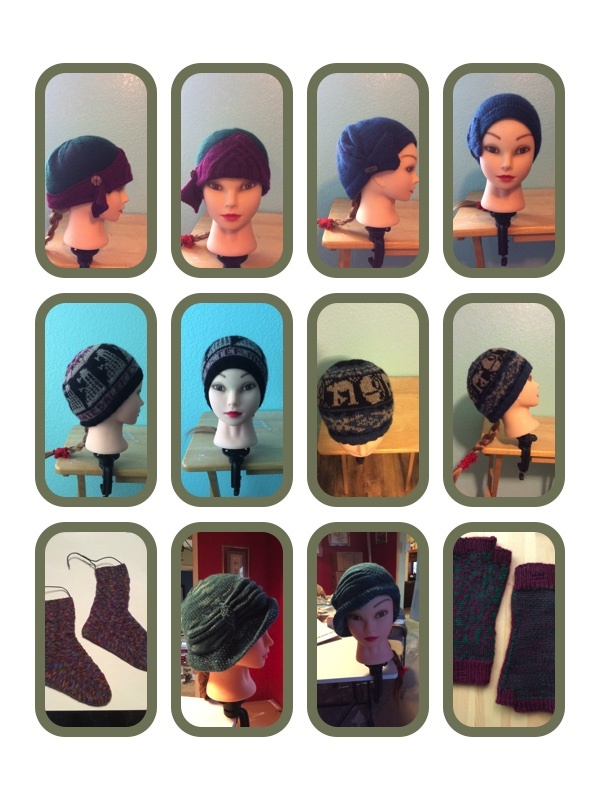 This is all the stuff I've knit and finished in January. 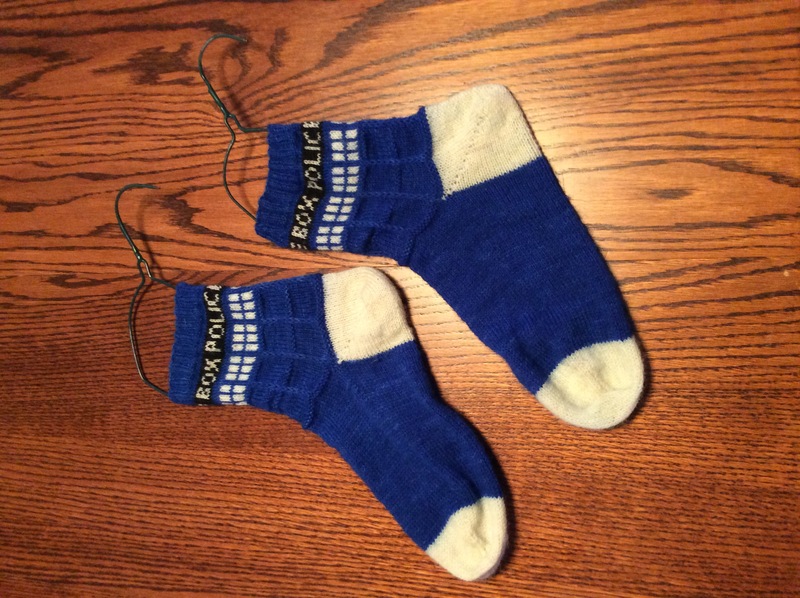 The socks were started....in late September, but all the rest was started and finished in January. What can I say? Stress knitting at it's finest! Also, all the January stuff is knit in worsted weight yarn - which is thicker than my beloved sock weight, and knits up faster. I am in the midst of another set of fingerless mitts......my kitchen can't be finished soon enough! I'd like to knit something...smaller. Like socks. Right now, though, I can't get to my ball winder, so I have to knit with yarn that comes in ready-to-knit packages. :shrug: I can always use another hat or two or three....:rofl: Especially "fashion" hats like the cloches - they're warm, and cute, and give me options. As do the 2 new geeky hats.....Star Wars and Dr. Who for the win! Back to the knitting.......beats painting. Which I did yesterday - the kitchen has been redone AGAIN. I....liked the aqua-isa blue, but I didn't love it. It's now a nice Federal/French blue...and I LOVE it. It's a bit dark right now, but once the white cabinets go in it'll pop. Floors are DONE. Finished. Beautiful. The kids' bathroom is virtually done - the grout needs to finish curing (tomorrow evening!) and we need to hang the towel rack and rehang the door, but I can mark it off the list. And the kitchen cabinets have been ordered and will be delivered Jan. 30. Let me repeat that: My Kitchen will be Delivered 1/30/17. ! I need to talk about that - because my experience wasn't what the internet said it would be. It was better. Remember, I paid $249 to get Ikea's partner Traemand to come out, measure, and plan my kitchen for me - and I think that's why the actual ordering process went so quickly. The Internet told me to a) get there right as the doors opened (we...didn't. :sigh:) and be prepared for a 2 or 3 hour ordeal - because the salespeople had to place the order line item by line item. :shudder: So, I was prepared for a long, drawn-out ordeal. We got there at 11 (because SG decided to pay off the piano first, instead of 2nd. :sigh:), and had a 30 minute or so wait. To say they were packed would be an understatement - and it looked like almost everyone wanted to PLAN their kitchen right then. (I don't know why they weren't set up on the planner and left...that's what happened the first time we went in, but I digress.) When my name was called, the guy asked me what I needed; I said, "I'm here to order my kitchen." He went pale. "Traemand sent me all the paperwork - and I have it - what else do you need from me? Do I need to sign in the planner?" He took a deep breath, said "You went thru Traemand? This'll be easy, then! Let me see the papers...." He found the plan #, typed it in, told it to convert to a sales order, removed the appliances (because the guy at Traemand didn't.....he was hoping we'd order the Ikea appliances, too. HA! Not even....), double-checked the number of items, and hit "final". He then got his supervisor over (he's been with Ikea for 12 years, but just started in kitchens) to make sure it was done correctly; she "fixed" a few things, told him how to get me the "free" gift card (the refund from the planning fee), then watched him check me out. We were done within 30 minutes of his calling my name. I am expecting 124 packages, weighing 599.9 Kg. :gulp! : We have 48 hours to do an inventory after they drop the stuff off; after that it's on us to pay for anything missing. Damaged items will be replaced free of charge - they just want to make sure we actually received everything we ordered. Insurance had allocated about $4,000 for the lower cabinets and countertop ONLY.....so I think we did pretty well. The contractor we consulted quoted $5,000 for lower cabinets and countertop; that did include installation, but no uppers and no bar. I think we came out ahead, actually - and I LOVE how the kitchen looks in the planning tool. I am in a faint freak-out phase right now; we have NO kitchen at all (the sink was torn out for the floors, and can NOT be reinstalled.) We DO have a microwave....but it'll be coming out a day or 2 before the install. I am SO ready for all this to be over! In good news, I have another new hat, and I've started yet another one. We ran out to Tuesday Morning today; they have a bunch of Clover wooden needles (both circular AND straights) for $2.99 (yes, Mom - I left some! :lol: RC's is Right There if you wanna go shop! ).....I filled in the blanks in my collection, and added a few more balls of yarn. Today is work-day; Cyn needs it by this weekend, so I need to get cracking! I still need to work on my short rows - these are still icky looking on the inside. I found a YouTube, so I think I've figured out what I've been doing wrong. I also need to RINSE any blue yarns I dye much better - there's some bleeding going on. :sigh: Oh, well - live and learn, right? I finished his socks on Sunday, and Monday I CO a hat for me....which I cast OFF yesterday. Yes, 24 hours for a hat. It helped that it was worsted weight, and an easy geometric pattern. This particular pattern is an old Middle-Eastern weaving one - I think it's called Ram's Horn. 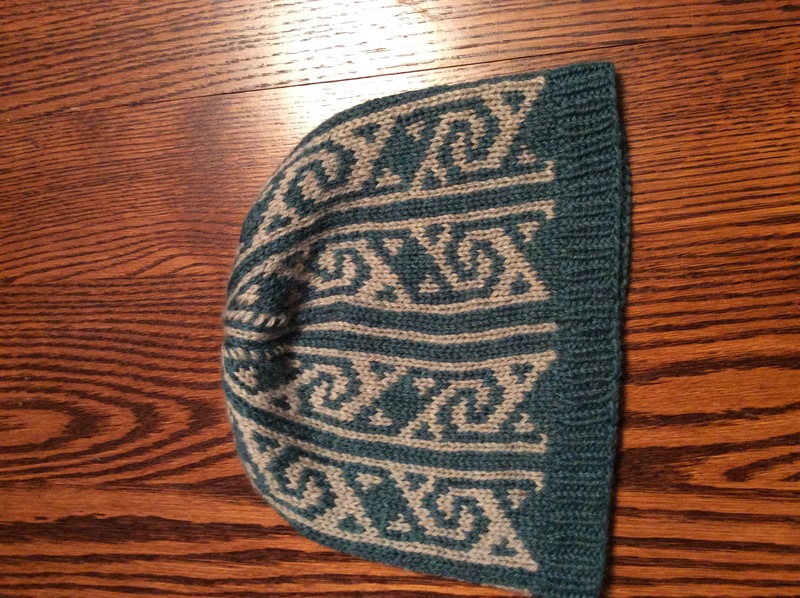 I dunno; I saw the hat pattern on my "We think you'd like..." board on Rav, and it grabbed me. So much that I BOUGHT the yarn specifically for it last week. 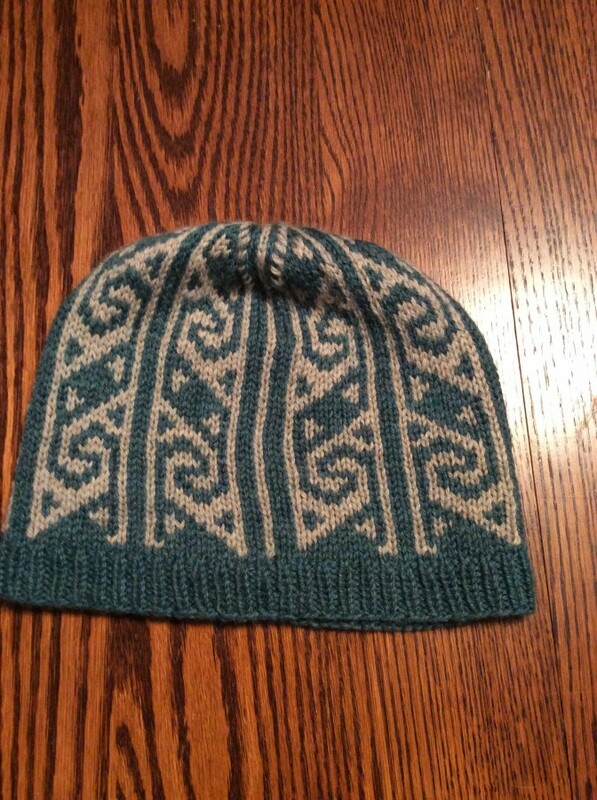 I'm pleased with it - the colors work, it was a fun knit, and it'll make a nice addition to my hat rotation. Well, onward and upward! Current project is: Shoelace #2. Gotta get it done by next Friday. And today is shopping day, so I need to get ready for that. Laters! I think. Still stuffy, sneezing all over the place (I don't usually sneeze. Right now? It's epidemic. :sigh:) Headache-y, dry, itchy eyes...but hey! I'm awake! And semi-coherent!! I also started a hat for me.....yeah. I'm borked. But hats are fast and useful and on larger needles than socks - and my wrists need that right now. I need to go blow my nose again. Laters! Which we need, but it makes it hard to meet my daily steps goal. I've been reduced to pacing around the house...ah, well - I NEED to shift the weight, so pace I will. SG's Hanukkah present - a GoT hat. He picked out (and bought!) the yarn. A pair of fingerless mitts for SG's step-mom. She said her hands are always cold, so this should fix that. She's wool-worthy, but not wool-wise, so this is acrylic. It was actually not bad to work with - I still prefer wool, though. A hat in an Owl theme for Cyn. She collects owls, so this seemed a perfect fit. And a cowl for SG's aunt - she requested it, in red, but not too fussy. It's a feather-and-fan variation in a nice, bright red. Shabbat Shalom, and Happy Hanukkah! I forgot this - because I am trying to forget it for real. :weak grin: It...well. We have......many dogs. Critical mass, to be exact. Bailey, Bree and Kenzie are "good" dogs - they tend to spend most of their time imitating speed bumps. Tigger...is a pain, but not destructive. Chloe...well, she's been destro-mutt from day 1, and she's taught Riley some bad habits. We think Loki is a wonder-dog, but I am beginning to think he's got us snowed. Why? Because the destruction had slowed down, until he came back from his operation. All of a sudden there's been an uptick in mischief. We left the house at 8-ish Friday morning, and walked in the door at 5:15. When we pulled up to the gate, I saw *something* out in the backyard, but couldn't tell what it was. So, we unloaded and I went into the backyard to assess the damage. Somehow - and I still can't figure this out! - 1 of the dogs managed to get MY violin case thru the pet door and into the backyard. Now, this is a rectangular case, with the pocket on top for music. So...it's NOT a small case by any means. Somehow, they managed to get it thru the pet door (something like 12" x 22", IIRC) and around the side of the house. WITHOUT damaging the violin or bow. The case, however.....the music pocket is gone, and the music that was in it was scattered all over the yard (I think I found all of it. :sigh:) The strap was chewed in 2, and they tried to get into the case, but they didn't succeed. Both SG and Herself were amazed that the instrument was unharmed; I reminded them that I bought that case 2 years ago and that it was Airline rated - meaning it was meant to be tossed around in an airplane's cargo hold. So *I* am not surprised that the violin came to no harm. Tadpole: Try Miller's Soap or The Dish. Just bue sure you have a good scale (that does grams as well as ounces) and take all safety precautions. Lye is dangerous - be safe. I spent some time Saturday sewing, but....part of it didn't work out. I decided to use the Featherweight - but I didn't realize that the foot isn't exactly 1/4". So....some of my seams pulled apart when I washed the item. :sigh: It was a gift, too...so I need to sit down and have a re-do. Not a huge problem - I can use the flawed one myself (and I *was* going to make one for me, so...this is OK.) This time I'll use my White, though....it's just, it was cold in the studio and I wanted to be warm. It's easy to set the Featherweight up in the dining room...I can't easily move the White. (It's HEAVY.) :shrug: It is supposed to warm up today, so.....I'll start cutting fabric soon. Today is Pajama day - I did have to get dressed to pick up feed, but soon as I got home I took a hot shower and climbed into my warm PJs. It's nice - we're all cozy by the fire. The kids are in the middle of a History test; they have a Chemistry test next. *I* get to relax while they work - it's nice! Hat: 1/3 done. Hats go quick, color-work ones moreso. It's fun watching the pattern develop! Loki is doing well. He was groggy when we picked him up, but the moment we got home he was FINE. In fact, he refused to snuggle on the couch and immediately jumped down to play with Chloe. Silly puppy! Not much else going on. Hope y'all have a great one! After numerous phone calls (I actually held it together during them - thank the knitting for that! ), they agreed to refund the $200. We're still "discussing" the overdraft charges ($134 worth. :OUCH! :)....I really hope they do the right thing. It's not my fault that I was assessed the charges, it was because of their error...but we'll see. Meanwhile, I knit. And knit. Auntie's mitts are *done*, SG's Balmoral is fulled and blocking (he knows about it; I had to have him try it on. Sure enough, I had to full it a bit more. ), and I am in the midst of a beautiful cowl for me. I have a pair of mitts for me, a pair of mitts for Herself, a pair of gloves for SG and for Himself, and a Balmoral for Himself in the queue.....those'll keep me busy for a while. Chloe is a dream puppy. So far, no destruction (other than muddy paw prints). She likes to take stuff outside, but - so far! - she hasn't eaten them. She likes to get into the trash...so the can now lives on the counter. She's a total love-bug - which Himself needed. I think he chose (well, he was chosen!) a good dog. We've had rain - Praise the Lord!, and it is glorious! Chilly, but hey - Rain! Let's see - this weekend we replaced the kitchen light. Finally. This was the original fixture - from 2003. Same bulbs, even - the fluorescent bulbs were finally getting dim. We now have a pretty, 5-light decorative fixture (with halogen LED bulbs) that is BRIGHT. In fact, we're already calling it the "spotlight", because.....seriously. You could just about land a plane with it, it's so bright. :snicker: I think lower-wattage bulbs are in our future - these are 50-watt, and....BRIGHT. This is supposed to be a work-week, but.....guess what? I haven't received all the stuff yet. :sigh: I really wish they'd get their act together! It's almost time to start school - laters! Yesterday we took Auntie out shopping. She's having car trouble, and has *refused* to let anyone take it in to get it fixed. She says she doesn't need it, she can "go into a home and not bother anybody". :sigh: Not. Happening. Instead, I volunteered to take her out once a month for shopping/etc. I don't mind; she's easy to get along with, and I am humbled by her faith - I wanna be more like her when I grow up! :lol: She won't consider moving in with us (yeah, it'd be a bit of a bother to shift things around, but it's do-able, and we'd work it out. But....no, she won't do it. :sigh:), so this is the next best solution. has thrown me for a loop. He's designed his hat, right? - and I've been pretty much faithfully following his directions. So far, he's happy with what's on the needles...but then. This AM, I asked him about the very top of the hat - you know, the part where the hat gets smaller and finally closes up at the tip-top of your head? He hadn't graphed that part out; since I am on the last row of the last pattern, I figured I'd better get the top pinned down so I could finish up (I had planned on taking progress shots, to show how I got from the design to the finished hat, but....it knit up too quickly. I just started it for reals on Monday, and did NO knitting yesterday...and yet, I'm almost ready to start the crown decreases. :wow:). I hit my bookshelves...I found a LOT of 7-point stars, but he's adamant - it MUST be 8-pointed. So I hit Ravelry...after a 25 minute search, I found a pattern (not for free, naturally!) that'll work...and he said "Wait - I don't want you to have to PAY for it...maybe I need to...I dunno, I really want an 8-pointed star....but..." I sighed, and said "Look, it's only $5, and I can use the shaping on something else. I've already got 25 minutes invested - this'll make your hat go faster. Yes, I *could* try and figure it out myself, but I'd honestly rather pay someone who's already DONE the math for me." And this pattern has the EXACT colorwork he's thinking of - a star within a star within a star within a star. *I* won't have to do anything except jiggle to numbers to fit what I've got, and change the colors to match what I'm already using. Both of which are EASY to do. So....I'll be downloading the pattern later today, and hopefully his hat will be finished tonight/tomorrow. Then I get to start on a kippah - thanks for the idea, Ali! :wink: *That'll* go pretty fast - the motif is only 18 stitches, and kippot aren't that much knitting anyway. Can't wait!! Stupid Snips has decided that she belongs on the bed at night. I'm sorta OK with that - she's small; if it were Bree I'd have a HUGE problem (pun intended!) However....last night she decided my legs were the perfect pillows - and I couldn't move. If I hadn't been so tired, I'd have noticed the price and bought a couple more skeins - I need mittens, too. Ah, well - next time. :yawn: Is it morning yet? Got home last night at *7* pm. We left work late, had to buy horse feed, had to go pick up the Jeep (they didn't find anything, and charged nothing to add air to the tires. Oh, well....), had to grab dinner (I had the shakes pretty bad by then), THEN we had to eat and unload all the grain. In the freezing dark. Stranded knitting - or multi-color knitting - is NOT hard. If you can knit with 1 yarn, you can knit with more. It's just fussy. You have to work to keep your tension even over all the yarns - but it comes easier the more you do it. You have to *gasp* read a chart! Oh noes! Listen - you're reading *this*, right? Reading a chart is no more difficult. Enough rambling.....I'm hoping Ms boss doesn't come in. 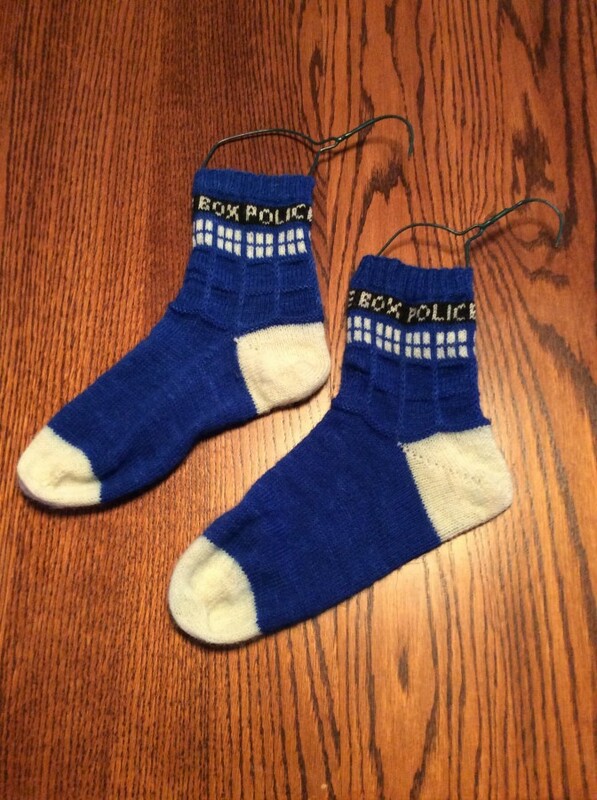 I have socks to knit work to do! Himself is turning into quite the reader. He's slowly plowing his way thru my Star Wars Expanded Universe books - these are *adult* books (NOT that type! ), not kids' books, so this is very impressive (Yes, I pre-read them. Not that I expect anything R- or X-rated in them - Lucas is VERY particular about what goes on in his sandbox, but you never know). For a 9-year old boy, this is very good. I foresee a trip to Half Price in the near future to get more reading material. Ah, well.....I'm off Wednesday. I *can't* roof by myself, but I can build a feeder and maybe run some fence. The goats are coming SATURDAY...we gotta get this stuff done! Must run - contract work due today!